Rotary maintains a strong connection to youth and young adults. The Rotary Club of Scottsdale has had a strong commitment to youth and youth projects since its inceptions. BOOK DONATION PROGRAM: (Patti Miller & Sandy Miller) The Rotary Club of Scottsdale donates one book for each of it meetings to the Yavapai Elementary School. COMPUTERS FOR KIDS: (Bob Murray & Jan Gehler) This program provides refurbished computers and new printers to worthy youth in the Scottsdale area. INTERACT: (Kevin Bollinger, Todd Brown & David Bertelli) Interact is a "Rotary Club" for high school students. 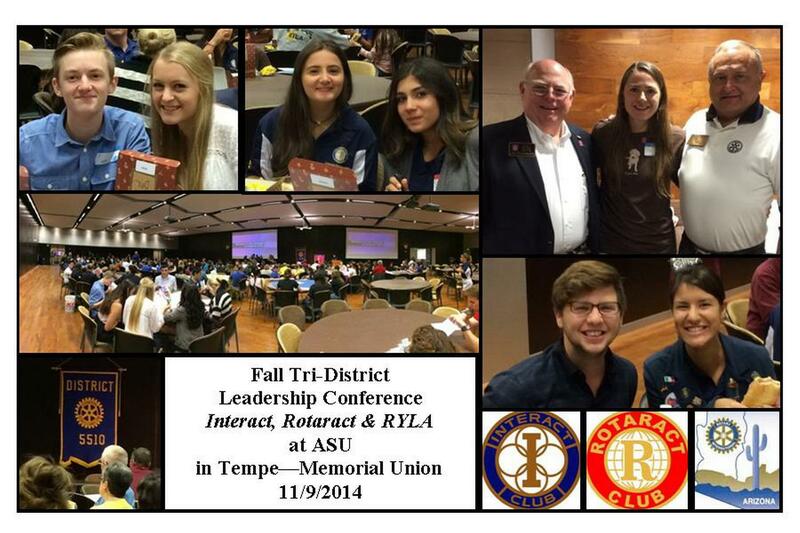 Scottsdale Rotary sponsors the Barker Interact Keystone Club at Barker Boys & Girls Club of America in Scottsdale across from Coronado High School as well as the Interact Club at Chaparral High School. Interacters perform community service projects and enjoy many benefits of fellowship with other service-oriented youth. For more information on Interact high school clubs, check out What is Interact? SCHOLARSHIPS: (John Campbell & Roger Rohrs) The longest standing tradition of the Rotary Club of Scottsdale is to award annual scholarships in a variety of categories to high school seniors. For more information on this program, including how to apply and how to provide additional support, please check out Scottsdale Rotary Scholarship Program. YOUTH EXCHANGE: (Mike Savastio & Sarah Crosby-Hartman) This program allows both inbound and outbound high school students to travel and study in foreign lands for an entire year. YOUTH MENTORING: (Tony Martino) This is a new youth program offered by the Rotary Club of Scottsdale. Students may apply to spend one hour interviewing a professional in the student’s Dream Profession. The students will be able to seek guidance and advice on the career opportunities, education required, what it takes to get a job and personal insights on the student’s Dream Profession. YOUTH SALUTE: (Mike Savastio & Sara Crosby-Hartman) Youth Salute is an annual competition in which high school juniors submit essays and undergo in-person interviews with judging groups of Scottsdale Rotarians for the purpose of winning an all expense paid trip to a national leadership seminar at Washington University in St.Louis. For more information, please check out What is Youth Salute?